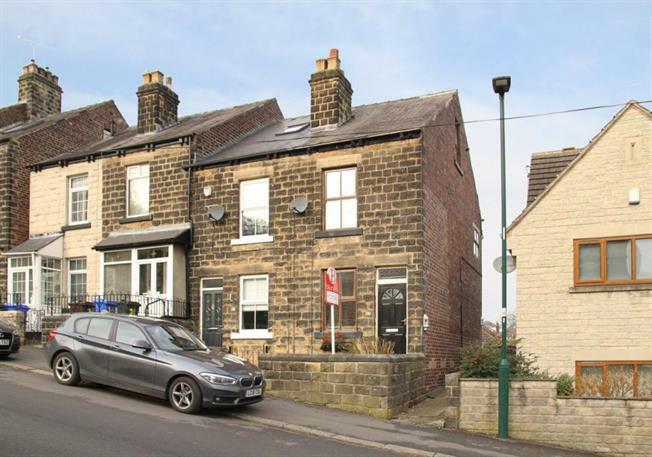 3 Bedroom Terraced House For Sale in Sheffield for £140,000. A fantastic opportunity to acquire with no chain this well presented three bedroomed end terraced home located in sought after Oughtibridge. Offering accommodation over three levels with the benefit of double glazing, GCH, forecourt and rear garden. Oughtibridge is a sought after village to the North West of Sheffield with excellent local amenities including local shops, schools pubs and restaurants, Hillsborough just two miles away has further excellent facilities including supermarkets, shopping centre, park, leisure centre and library with Supertram park and rise and bus station. The accommodation comprises a lovely lounge to the front with feature fireplace and carpeting with wooden sash effect window retaining the original character of the property. An inner lobby has stairs to first floor landing. The dining kitchen has an excellent range of base and wall units in a modern shaker style with contrasting granite effect work surfacing, integrated oven hob and extractor recessed into chimney breast, plumbing for dishwasher and washing machine, stripped floorboards, window and door to the rear garden. A further door opens to the cellar head. On the first floor, Bedroom one has wood effect flooring and window to the front. Bedroom two is carpeted with window to the side and offers flexible accommodation as second bedroom, study or nursery. The modern bathroom has contemporary three piece suite comprising, WC, wash basin and walk in shower with tiled splash backs, chrome heated towel rail and rear window. On the second floor the attic bedroom has stripped wooden floorboards and side window offering natural light. To the exterior of the property is a forecourt to the front and garden area to the rear providing an excellent outdoor seating and entertaining area.